If any of the rules above are violated, the drone operator is liable for fines up to a 500,000 JPY. *Please note that the drone laws are always changing. This is not a definitive guide and you must check with the local authorities and the Japan Ministry of Land, Infrastructure, Transport and Tourism directly for the most up to date laws and regulations. 1. Does your drone weigh less than 200 grams? If your drone weighs less than 200 grams, you do not need to get permission from the Ministry of Land, Infrastructure, Transport and Tourism (MLIT). But if you will fly your drone in densely populated areas such as temples, castles, tourist destinations, public parks, festivals, concerts, etc., you should notify the local facility administrator prior to flying your drone. 2. Will your drone fly in any of the following airspaces? 1. Download the application online. 2. Fill it out, and send out the first draft via email. 3. Receive feedback on the application from MILT. 4. Make any requested changes to the original application. Note: Steps 3&4 may repeat if you don’t change the applications as the MLIT requested. 5. When the application is approved, they will send you the non-official copy of the permission letter via email. They will also ask you to send a printout of the updated application form with your personal seal on it, along with an envelope and stamps to send the official letter back. 6. After a few days/weeks, you will receive the official permission letter. 7. And then you are ready to fly in Japan! **MLIT do have an online application system for Microsoft Windows users. Mac users are unable to use the online application form. If you are overseas and are a Windows user, then it may be the easiest way for you to apply. ****Depending on the location you chose to fly, you need to get a permission from property/facility management on your own. The permission from MLIT does not allow you to fly drones without these additional permission. The MLIT website recommends to apply at least 10 business days in advance but the lawyer advices to plan for 4-5 weeks in advance. 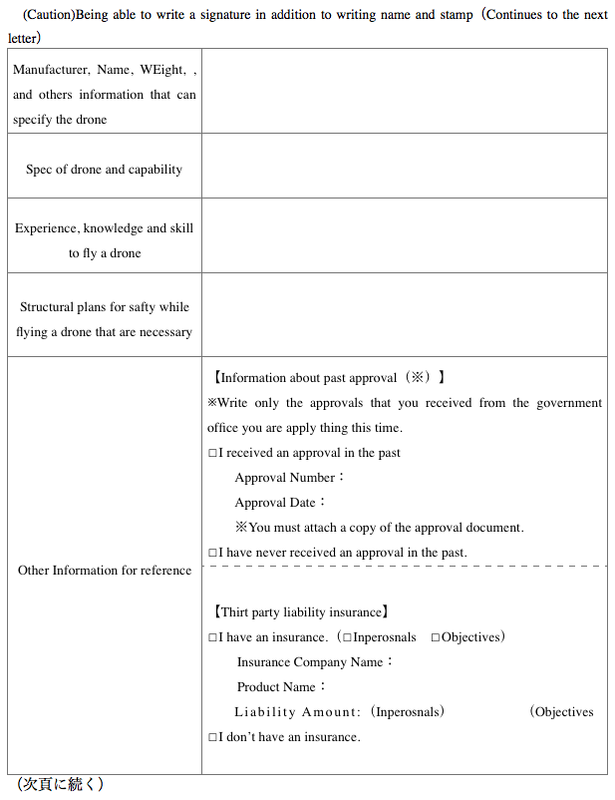 One thing you need to remember is that, if you want to fly near airports or above 150 meters, you have to get a permission from the applicable Airport Office in addition to the Minister of Land, Infrastructure, Transport and Tourism. Also, in the densely populate area in Tokyo, you need to get a permission from the property/facility management in addition to a permission from the MLIT so you might want to apply a few weeks earlier than what is recommended above. This may be the most difficult part in this process as the application form is quite thorough. For one, it’s all in Japanese. The MLIT do NOT accept English applications. There are a lot of boxes to check-off and some parts require a written explanation. The process can be slightly simplified if you have one of the pre-aproved drones on the MLIT's list. If you have a drone like the DJI MAVIC PRO which is on MLIT's list, you could copy and paste most of the stuff where you are suppose to write it in Japanese.